Switzerland Interline Travel Authority Air Line pass dated 1975 signed by Swissair President A. Baltensweiler. 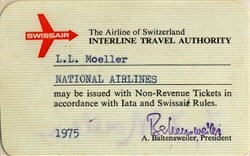 The pass was issued to L. L. Moeller, Director of Agency and Interline Sales for National Airlines. The Swiss Air Transport Company (Swissair) was formed on March 26, 1926, upon the merger of Balz Zimmerman's Basle Air Transport (Balair) and Ad Astra Aero, which was operated by Walter Mittelholzer. Both companies were originally founded in the early 1920's and operated a number of air routes between Switzerland and Germany. Swissair's fleet consisted of several aircraft built by Fokker, Dornier-Merkur, Messerschmitt and Comte. Later the company added Lockheed Orions, Curtiss-Condors, DC-2s and DC-3s to its fleet. At this time Swissair also became the first European airline to employ stewardesses. Walter Mittelholzer was killed in a climbing accident in 1937. Balz Zimmerman died unexpectedly only a few months later. Swissair, however, survived the deaths of its founders and continued to operate successfully throughout Europe. Yet Swissair was forced to cancel all operations indefinitely at the end of August, 1939. Nazi Germany had started a war in Europe which neccessitated the closure of all air services. Switzerland, which was determined to maintain strict neutrality, waited nearly six years for the war to end. The war brought important technological advances in aeronautics. And after the war many well designed and highly sophisticated airplanes became available. At the same time, railroads and highways were severely damaged and took years to repair. These conditions led to rapid growth in commercial aviation. Swissair, which was designated the national airline in February of 1947, later inaugurated a trans-Atlantic route from Geneva to New York using four-engine Douglas DC-4s. European air fares were based on the British pound which was devalued in 1949. The devaluation affected business at Swissair so adversely that the government, which acquired a 30% stake in the company in 1947, was asked to render it assistance. The government purchased two DC-6Bs and leased them to Swissair; Swissair later purchased these DC-6Bs from the government in 1965. In 1950 Swissair was reorganized into four divisions: Finance and Economics, Traffic and Sales, Engineering and Maintenance, and Operations. In addition, Dr. Walter Berchtold, director of the Swiss Federal Railways, was named the new president of the airline. In the next several years Swissair opened new routes to Lisbon and Dakar and from there across the Atlantic to Rio, Sao Paulo, Buenos Aires, Montevideo and Santiago. A route to the Far East included Bangkok, Hongkong, Manila and Tokyo. Newer aircraft were becoming available which were capable of carrying more passengers at greater speeds. Swissair continued to update its fleet with these new aircraft which included propeller-driven DC-7s and Convair 440s, as well as DC-8 and Convair 880 passenger jets. Swissair also shared a number of Convair 990 and French Caravelle jetliners with SAS as part of a cooperation agreement signed in 1958. Later Swissair became one of the first airlines to order DC-9s, and Boeing 747 and DC-10 jumbo jets. By the winter of 1968-69 Swissair had a fleet comprised entirely of jet aircraft. On September 6, 1979 a Swissair DC-8 en route from Zurich to New York was hijacked by terrorists from the Front for the Liberation of Palestine. The jet was forced to land at Dawson Field near Zerga in northwestern Jordan. The hijackers demanded the release of three terrorists being held in a Swiss prison. A settlement was reached and the terrorists were exchanged for the hostages. During this time, however, a civil war erupted in Jordan. The Swissair jet was allowed to leave, but in the fighting a TWA 707, a BOAC VC-10, and a Pan Am 747 were exploded at Zerga and completely destroyed. Swissair concluded an agreement with SAS in 1958 and with KLM in 1968 which provided for the establishment of a joint maintenance pool. The privately owned French airline UTA joined the group in 1970. Each company performed a specialized task in the maintenance of certain airplanes. Later the "KSSU Group" jointly negotiated with McDonnell Douglas for the purchase of 36 DC-1Os. Swissair's president, Dr. Berchtold, retired at the end of 1971 upon reaching the mandatory retirement age. He was succeeded by Armin Baltensweiler, an administrator with a strong background in aeronautical engineering. Swissair under Baltensweiler continued to expand and modernize its fleet. One of the airplanes it was particularly interested in purchasing was the A-310, produced by the European Airbus consortium. Swissair later ordered 10 of these airplanes. The Swiss Federal Railways, one of the most efficient railroad systems in the world, opened a terminal at Zurich airport in 1980 providing passengers with access to local and intercity rail service directly from the airport. Swissair also concluded an agreement with the Swiss national domestic airline Crossair defining each company's respective area of activity and establishing areas of cooperation. Swissair opened routes to Beijing and Shanghai in 1975. The commercial value of these destinations was minimal, but it reflected the Swiss government's interest in normalizing relations with all countries. In a similar move ten years later Swissair opened a route to Tirana, Albania, one of the poorest and most politically repressed nations in Europe. Armin Baltensweiler, who served as president of the International Airline Transport Association from 1981 to 1982, was promoted to board chairman when the previous chairman, Fritz Gugelmann, reached the mandatory retirement age in 1982. As a result, the company's deputy president, Robert Staubli, was named president. The airline encountered financial difficulties in 1982 due to declining passenger traffic and rising expenses. The previous year Swissair posted a record operating loss of $27.6 million. In an effort to lower costs Swissair reduced a number of customer services. Ekkehard Endrich, a Swissair executive, told The Wall Street Journal that "The results were OK on the financial side, but the echo from passengers was horrible." Even economy-class passengers began to complain about such things as plastic wine glasses and sandwiches (instead of hot meals). Consequently, Swissair looked to other areas to implement their austerity measures. Swissair's employees are among the highest paid in the world, and even though they did offer to defer pay increases the airline decided instead to concentrate on keeping as many seats as possible filled with full-fare passengers. To this end, Swissair introduced a business-class service to appease passengers who complained that regular economy-class was too spartan and first-class was too expensive. It is interesting to note that Swissair does not offer cut-rate tourist fares. Determined to avoid the popular notion that flight attendants are merely "waitresses in the sky," Swissair has developed strict selection and training programs for all flight personnel. Flight attendants are also required to be fluent in at least three languages. The meals served on Swissair are among the best available. Those which are not prepared in Swissair kitchens come from caterers whose work is supervised by Swissair chefs. In addition, Swissair has trained security people on most of its flights. They are provided by the Swiss government and are trained to deal with such terrorist acts as hijackings and bomb threats. Swissair lost revenue on its passenger services from 1979 to 1983, but offset these losses with non-operating income from activities such as selling airplanes. Despite operating losses and the high cost of fuel, Swissair has remained profitable since 1954. Some of that success can be attributed to the airline's high aircraft utilization rate; all operational aircraft are transporting passengers. Swissair has been described as the "bank that flies." In fact, dividends are so stable that the company's stock performs more like a bond. Swissair's finances are very conservatively managed. As a result, the airline has considerable liquid financial resources. If it is unable to secure a loan with favorable terms, it can easily make purchases with cash. In fact, over the last 15 years 80% of the company's investments have been funded from its cash flow. Swissair's corporate strategy is long-term, usually five to ten years. However, "In U.S. terms," Staubli told Forbes magazine, "strategic planning is 'What am I doing next week?' " An example of Swissair's strategy is its decision to be the launch customer (first to order) for the new Fokker 100 passenger jet from Fokker Aircraft. Swissair was searching for a new jetliner to replace its aging and noisy DC-9s. Swissair is not as concerned with the resale value of its older jets as with the efficiency of the newer models becoming available. In some passenger markets the Fokker 100 can generate a profit with only 30% of its seats occupied. Government regulations in Switzerland require that a tax be paid on airplanes that produce a large amount of noise. And because the next generation of fuel-efficient airplanes (the McDonnell Douglas MD-91 and Boeing 7J7) are noisy "propfans," the Fokker 100 will continue to serve as Swissair's main medium capacity passenger jet. In Swiss cities such as Zurich noise pollution is a serious ecological concern. Since the area around Klosten airport is residential, Swissair has spent a large amount of money to make engine maintenance procedure as quiet as possible. The 20-minute ground tests are conducted either in sound-proof hangars or in front of large "detuner" muzzles on the tarmac. Moreover, the use of thrust reversers (exhaust shields which redirect engine thrust forward after landing) is discouraged in favor of wheel brakes. Another problem faced by Swissair is the perpetual fog which hovers over Zurich's Klosten and Geneva's Cointrin airports. During World War II the Swiss air force burned petroleum along the runways to lift the fog. Research in other fog lifting systems is currently in progress, but in the meantime Swissair is using sophisticated electronic devices to assist aircraft in finding the runway during low visibility. The company's efforts to make its passenger business more profitable have been successful. In 1985 Swissair generated an operating surplus of over $11 million. In addition, the company's two vacation charter subsidiaries, Balair and CTA, turned in equally good performances. A third Swissair subsidiary, Swissair Associated Companies, Ltd., did well enough in 1985 to offer dividend for the first time. The Associated Companies division controls (to various degrees) 29 subsidiaries of its own, including hotels, catering services, tour packagers, business consultants and insurance and real estate companies. Balair, Ltd., Basle(57%); Compagnie de Transport Aerien (CTA), Meyrin (57%); Swissair Associated Companies, Ltd., Basle. Principal Subsidiaries of Swissair Associated Companies, Ltd.: Swissair Nestle Hotels, Ltd.(51%); ICS Catering Services, Ltd.; Swissair Photo and Survey Ltd.; Kuoni Travel, Ltd. (50.2%); Swissair Auditing, Ltd.; Uto AG (75%); Avireal AG; Meier und Wirz AG; Interconvention, Ltd.